Chameleon of the Arduino Compatible world. 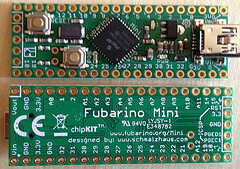 The Fubarino™ Mini is small 33 pin Arduino API compatible board with a difference. The PIC32MX250 part used on Fubarino Mini has a Peripheral Pin Select function for almost all of its I/O pins. When writing sketches for the Fubarino Mini, you must remember to connect an internal peripheral (like SPI or UART) to a particular set of I/O pins using the PPS functions (ppsInputSelect() and ppsOutputSelect()) before trying to use the peripheral. See the example code for more detailed information.